Welcome back! Or if you are new here, welcome! I hope everyone had a wonderful Thanksgiving and weekend. We are stuffed! I'm so excited to introduce the Crinkle Quilt-- a tutorial up at the Moda Bakeshop! This has quickly become a favorite in our house, and it really does come together quickly. I did this quilt up in one Saturday morning while the kids and my husband were watching football. You can take a look at all my quilting posts here. The quilt has ruched strips going across the length of the quilt. If you are making this quilt-- check out the Rufflicious Series; you can use any of the ruffling methods to make the ruched strips in the quilt. The fabric line is Simply Color by V and Co, and it's absolutely gorgeous! My kids love the texture and the bright colors of the quilt. In fact, about a week after I finished the quilt, I found a few scraps of blue fabric in Ishaan's 'collection' box. This quilt can also be made with a serger (Mini Crinkle Quilt tutorial). I can tell this quilt is going to be a favorite around here for a long time! 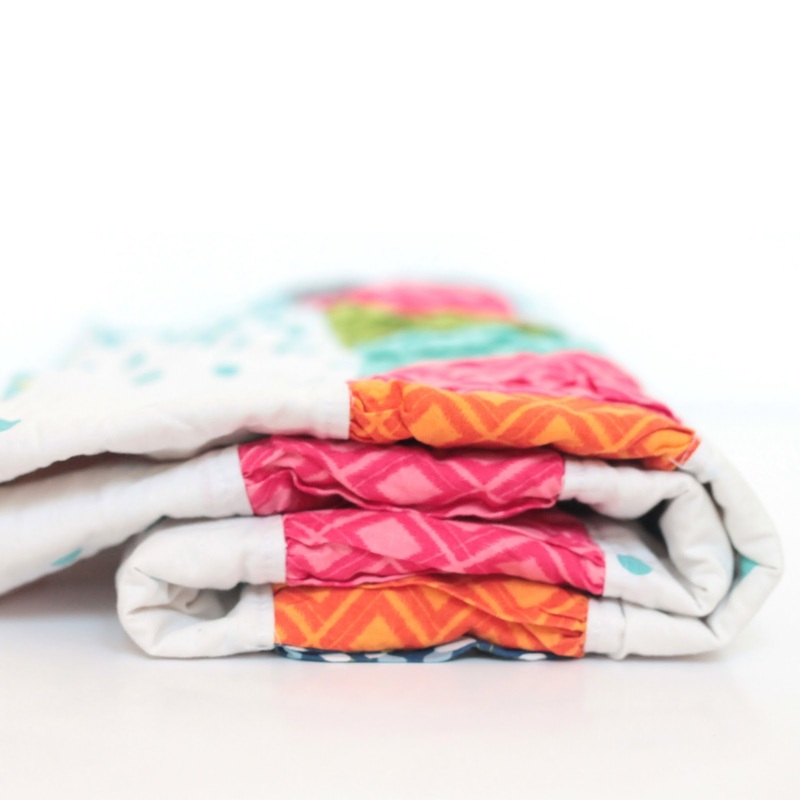 Check out the Crinkle Quilt Tutorial! Thanks for sharing such a great project with the fans of moda bake shop. Lissa, Thanks for your sweet comment! That is such a gorgeous quilt!!!!! Way cute going to make it for my daughter for Christmas! Perfect! Id love to see pictures if you finished it! I just bought a gathering foot for my Pfaff, and this will be a great project to try it out. This is the perfect project to go with a gathering foot-- you'll be done in a snap! I just got a gathering foot for my Pfaff, and this will be a great project to try it out.